Where can you buy certified organic coconut oil? We've learned many times at Biome that every idea will have its day! And it appears that the time has come for the idea of Organic Coconut Oil. Although some people, like Bruce Fife of the Coconut Research Centre cracked this coconut wide open many years ago. The connection between heart disease and coconut oil that frightened so many people never existed. What most people didn't understand at the time was that there are many different types of saturated fat and that the fat in coconut oil is completely different from that found in animal fats. This difference is important because it's what makes coconut oil unique and gives it its remarkable healing properties. Of course, there are some who are not so upbeat about coconut oil, so please do research and decide for yourself. Remember that virgin (unprocessed or raw) organic coconut oil is very different to hydrogenated coconut oil, which is not healthy. Biome has sold organic coconut oil for about two years. Originally it was a customer in store who suggested we should take a look. Then it turned out that some of the healthy living Biome team were already experiementing with coconut oil! Healthy eating role models like Sarah Wilson have promoted the organic coconut oil message for many years (here is a 2011 post from Sarah Wilson that explains perfectly what is so great about coconut oil). Sarah is now regularly called upon by the media to talk about coconut oil. You can read more about Coconut Oil on the Coconut Research Center website, where Dr Fife explains the drastic economic impact there has been for Pacific communities. He writes: Up until the mid-1980s coconut oil was commonly used in many foods. The anti-saturated fat campaigns sponsored by the soybean industry and misguided special interest groups succeeded in frightening the public away from using coconut oil and food manufacturers and restaurants eventually replaced it with hydrogenated soybean oil. By 1990, coconut had virtually disappeared from American and European diets... Demand for coconut products plummeted and the coconut industry fell into a deep depression that lasted for two decades... Literally millions of farmers, pickers, consolidators, truckers, and processors were no longer able to earn a living...They barely eked out a living year by year on a pauper's wage. Why is organic coconut oil finally having its day? It appears that the relationship between coconut oil and "sugar" has propelled it into the mainstream. We have seen the Sweet Poison and no sugar diet phenomenom, coupled with more people needing to manage Type 2 Diabetes. And, as Sarah Wilson explains, coconut oil helps stop sugar cravings and energy slumps. Your body sends medium-chain fatty acids straight to your liver to use as energy. This means that coconut oil is a source of instant energy to your body, much like when you eat simple carbohydrates. But although they both deliver quick energy to your body, unlike the carbohydrates, coconut oil does not produce an insulin spike in your bloodstream. This saves you from a slump, and is good news for anyone struggling with insulin issues. 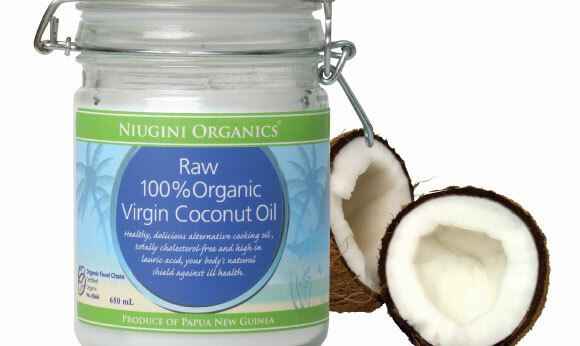 Niugini Organics claims that reliable scientific evidence indicates that coconut oil stimulates the metabolism without the production of insulin, assisting with the management of Type 2 Diabetes and Cholesterol. Secondly, we are also learning that some vegetable oils, like olive oil, can be harmful when heated - whereas organic coconut oil can be heated to 170 degrees Celsius without turning itself into a trans-fatty-acid or transfat. People using safe, non stick cookware such as Neoflam, know to use coconut oil because it does not ruin the non stick cookware surface. Read more here about Coconut oil for skin and which coconut oil is best? Tracey Bailey is the founder of Biome Eco Stores and mother of two. After working in corporate communications and starting a family, she made a choice to be part of the solution to our planet's future and started Biome Eco Stores. Tracey is passionate about educating the community about living eco-friendly and sustainable lives through her extended product, chemical, health and environmental knowledge. I think that using tons of chemicals on your face and body is just stupid so I prefer natural remedies like coconut oil, jojoba, aloe vera, and others. Highly recommended! About Vinegar, Imitation Vinegar, Acetic Acid, and E260.